Timothy Lapitan remained in critical condition this morning after being shot by one of five men during a home-invasion robbery. 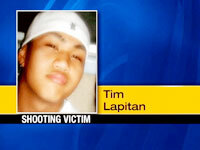 Timothy Lapitan, 19, was shot yesterday after five suspects went into his 1256 Hulakui Drive home. The 19-year-old Aliamanu man was one of three people at home when five male suspects entered their home on Hulakui Drive at 10:56 a.m. yesterday, police said. Police were searching for five suspects, all of whom were apparently wearing masks and armed when they entered the home, according to witnesses. One shot was fired after an altercation in the home, and the men took electronics and other personal items before fleeing on foot, police said. The victim was taken by ambulance to the Queen’s Medical Center, police said. Police Maj. Kurt Kendro of the Kalihi station said while there is tension between two area gangs, the Aliamanu Boys and the Salt Lake Boys, it is unclear whether the victim was a member of either group. Police were looking for five armed men suspected of robbing an Aliamanu home and shooting a 19-year-old resident late yesterday morning. The victim, Timothy Lapitan, was taken by ambulance to the Queen’s Medical Center in critical condition, police said. The suspects, described only as young men, were masked when they entered the home at 1256 Hulakui Drive at 10:56 a.m., said police Maj. Alan Bluemke. There was an altercation inside the home, and one shot was fired, he said. The men took electronics and other items before fleeing on foot, Bluemke said. He said all suspects appeared to be armed with handguns, according to witnesses. No drugs were found at the home, and it is unclear what led to the confrontation, police said. Police were interviewing two women who are relatives of Lapitan and who were in the house during the incident. About a dozen police officers converged on the scene while a helicopter hovered above. 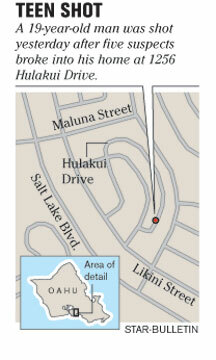 Police say five masked males, all armed robbed a home and shot a man on Hulakui drive in Aliamanu at about 11:00 am Monday. Area residents said they heard a shot but did not see the suspects. “I just heard a single gunshot. I came out, there was nothing. Ten, 15 seconds and they were gone,” said next-door neighbor Vance Montayre. Montayre said he believes the suspects must have used a car to escape. There are about three families living in the large home that was robbed, Montayre said. He said the residents keep to themselves, though police have responded to complaints of noise in the house. Lapitan had backed up his car into Montayre’s parked truck five months ago, he said. “He seemed all right to me. Young, full of energy,” Montayre said. Other residents said the neighborhood is quiet except for occasional fireworks. Mary Ah Nee, who lives a few houses from where the shooting happened, said crime appears to be growing in the area, noting the car of a close neighbor was damaged over the weekend. Some residents suggested the shooting might have been gang-related. Police said anyone with information about the case should call 911 or CrimeStoppers at 955-8300.